The clean lines of Max Mara’s black Gala jacket demonstrate the label’s sophisticated aesthetic. It’s made from virgin wool with a hint of stretch, is a single button fastening. 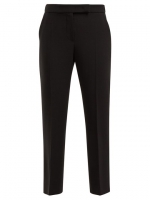 Keep it at the core of your working wardrobe, styled with the coordinating Ostile trouser through the week.